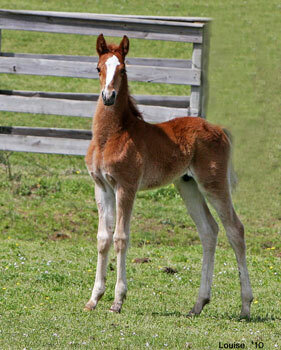 2006 Forty-Third's Make My Day- (Chestnut Colt by Forty-Third Street)- . WC For Reference Only (7 SBR Points)- 2003 Tampa Charity 3 Gaited Country Champion. 2003 Dixie Cup 3 Gaited Country Champion. 2003 Humanitarian's Challenge 3 Gaited Country Grand Champion. 2005 Ohio State Fair 3 Gaited Show Pleasure Grand Champion. 2005 Kentucky Fall Classic 3 Gaited show Pleasure Champion. 2006 Ohio State Fair 3 Gaited Show Pleasure Grand Champion. 2006 KSF WC 3 Gaited Show Pleasure Adult Div. III. 2008 Summer Fun 3 Gaited Country Grand Champion. 2009 Summer Fun 3 Gaited Adult Show Pleasure Reserve Champion. 2009 Harvest Days 3 Gaited Show Pleasure Adult Reserve Champion. 2010 Summer's End 3 Gaited Country Champion. 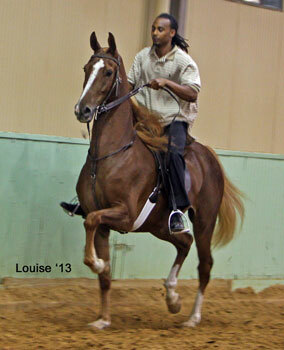 2010 Citrus Cup 3 Gaited Country Grand Champion. Kilarney's Parading Princess- 1985 American Royal Fine Harness Ladies Reserve Champion. 1991 Santa Barbara Country Driving Reserve Grand Champion. 1991 Winterfest Country Driving Reserve Grand Champion. St. Stephen's Crown- 1991 California Grand Nation Fine Harness Reserve Grand Champion. 1992 Hollywood Benefit Denver Junior Reserve Champion. California Grand National 3 Gaited Show Pleasure Reserve Grand Champion. 1999 UPHA Spring Premier 3 Gaited Adult Country Pleasure Reserve Grand Champion. Spartan's Sting- 1990 Monterey Springfest Country Driving Reserve Grand Champion. 1990 Santa Barbara Country Driving Reserve Grand Champion. 1990 Northwest Country Driving Reserve Grand Champion. 1991 Monterey Springfest Country Driving Reserve Grand Champion and Country Driving Champion. 1991 Santa Barbara Country Driving Reserve Grand Champion. 1991 Winterfest Country Driving Reserve Champion. 1992 Carousel 3 Gaited Country Reserve Grand Champion. 1993 Monterey Springfest 3 Gaited Country Limit Reserve Champion. 1994 Monterey Springfest 3 Gaited Country Limit Reserve Champion. 1995 Monterey Springfest 3 Gaited Country Limit Reserve Champion. 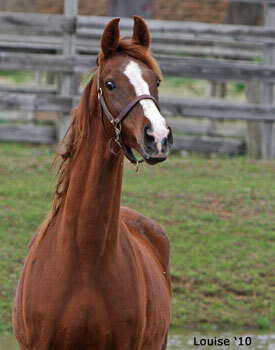 WC Kilarney's Parading Promise (13 SBR Points)- 1983 KSF WC Fine Harness 3 Year Old Mare. 1984 KSF WC Fine Harness Mare. 1986 Midwest Charity Fine Harness Ladies Champion. 1987 Charity Fair Fine Harness Ladies Champion. 1987 Scottsdale Charity Fine Harness Grand Champion. 1988 Cares Cal. National Fine Harness Grand Champion. 1988 Charity Fair Fine Harness Grand Champion. 1988 California Futurity Fine Harness Grand Champion. 1989 Del Mar National Fine Harness Grand Champion. 1989 Charity Fair Fine Harness Grand Champion. Apt To Parade- 2000 MN State Fair 3 Gaited Adult Show Pleasure Reserve Champion. 2003 MN State Fair 3 Gaited Adult Show Pleasure Reserve Champion. 2005 Tanbark 3 Gaited Adult 39 & Over Champion. 2008 MN Futurity Open Model Champion. 2008 Octoberfest Park Pleasure Amateur Champion. RWC March Of Dimes- 1954 KSF RWC Weanling. 1957 KSF RWC 3 Gaited 3 Year Old. WC Parading Stonewall- 1963 KSF WC 3 Gaited 3 Year Old.